Rural NE Thailand, Issan, is a mysterious place to Westerners, the culture is strong and strange. For example the people believe absolutely in spirits which are active in their daily lives. Pre-buddhist animistic beliefs are still fundamental to their culture. There are parallels with Japan, as Thailand was also never colonised and was untouched by European influences. So the ancient culture has survived and it is very difficult for Thai people to learn European languages. The Mekong flood plain is a very fertile area where people have settled for thousands of years. Their customs, the landscape and their lives are integrated into a well established ecosystem. Unfortunately this is changing, although it always surprises me how few pests their are and how much people rely on local food, trapping frogs, fruit from trees, ants, insects, rice rats, snakes, mushrooms, birds these are all collected and eaten. I have experienced many examples of their absolute belief in spirits and when you are living in the village its hard not to think that there are spirits around when the evening mists swirl and you hear the sounds of distant gongs. I hope you will also feel this magic during your painting and photography holiday with us. Our neighbour across the road, cut down a tree in her farm which is inhabited by spirits and failed to plant a replacement. Some months later she had been drinking heavily in the evening. In the middle of the night everybody in the vicinity was woken by her screaming. She gabbled unintelligibly for some time before they managed to quieten her down and get her to sleep. In the morning when it was discussed I was told that it was definitely a spirit that had inhabited her as a result of the tree which was cut. I suggested it might have been the DTs but was soundly put down in my strange belief. One of the Head Men in the village rolled his pickup driving quite slowly and was killed. This was definitely the result of a spirit. For some time my father-in-law lived on a farm by a nong (lake) where he was growing fish. Then he had to leave as a bad spirit moved in. They put up a spirit house but it didn't work. Later he thought he had stomach cancer as a result of the spirit and we drove him to a village 30kms away to a Shaman who would cure him. I watched the complicated ceremony that was performed which included a ritual bathing to exorcise the sprit. There is no question that it worked as when we took him to a western style hospital the cancer had gone. The photos here include the only ones I have of a Shaman at work. "I’ve followed with some interest the various intimations by foreigners and expats that there is something about Thai culture that forever remains beyond reach. Of course, it is an insular culture and has been for centuries, which explains it in part. Many specifically remark the inherent “superstitiousness” of the Thais and have noticed that blend of pagan animistic beliefs with the later Buddhist influence that makes Thai religion so interesting and, to foreigners, impenetrable. The spirit houses outside of every building in the country is viewed by many outsiders as a curiosity, or condescendingly dismissed as naïve superstition. However, these belief systems are partly responsible for the sense of alienation that westerners often feel. Not so much perhaps when they are among urbanized Thais such as those living in BKK, but perhaps more so among the Isaan. The urban Thais seem hold on to folk beliefs as artifacts of an earlier, pre-industrial lifeway that exists in modern urban Thailand only as nostalgia. The people from Isaan, though, and from the small baans and hill tribe villages scattered around the north, bring with them some intact traditions that explain, in some part, their seemingly alien spiritual beliefs, their inscrutable behavior, and, most significantly, their warmth and kindness that many visitors find so refreshing. In my travels around Thailand (especially the north) and in my experiences in other places where there is rich tropical plant diversity and relatively undisturbed areas where native or indigenous people live (such as the Brazilian Amazon or the hill tribe areas in the Golden Triangle), I have found very consistently that there are individuals skilled in ancient ways of healing and in the uses of medicinal plants. The equivalent, I suppose, of shamans. On a recent trek near Pai, our Lisu guide pointed out to me plants used for nearly every variety of ailment, from snakebite to impotence. This is ancient knowledge, handed down through the oral traditions for hundreds perhaps thousands of years. Indigenous rainforest people continue to seek new plant properties, many dying in the process of searching for medicine. This process seems to also be going on in Thailand. Some of these plants have psychoactive properties, of course, but they are not “drugs” in the way we think of hallucinogens like mushrooms or LSD. They’re used by shamans to achieve “non-ordinary” states of consciousness in which they are able to communicate with what is often called (almost universally among cultures that have shamanic traditions) “the spirit world.” To a shaman and to the cultures they serve, the spirit world is not a folk belief or a hold-over from earlier primitive religious practice. It is a real and palpable world populated by entities with both good and bad intentions and who communicate with humans; indeed, humans themselves also exist halfway in the spirit world as well. The shaman’s job is to communicate with these spirits to find healing knowledge. Anyone who partakes of certain plants is also put in direct contact with the spirit world; it can be terrifying and challenging. It takes courage and work, but once you are in that world, it is as real and as obvious as this reality – in some ways even more so. The presence of this tree usually indicates some form of shamanic practice or knowledge. And if you’ve been to Isaan or the Mae Hon Song loop, you’ve seen hundreds of them. 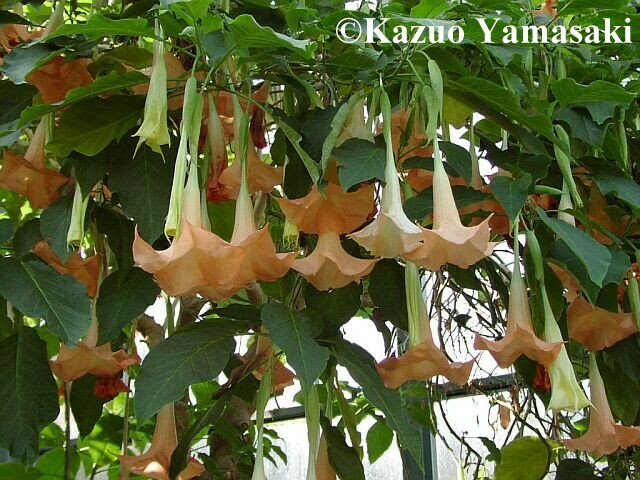 The chemical derived from it is called “datura,” and it is very dangerous. Lethal if improperly prepared. An experienced shaman, however, knows how to use this plant to enter non-ordinary reality, communicate with spirits, and heal the people in his or her community. If anyone out there has tried a plant called ayahuasca or yage from the Amazon rainforest or to a lesser degree peyote (in a ritual context), they will understand what kind of power these plants have. For the people living in such communities, the spirit world is, again, extremely real and always present. Many Thais from the north are influenced by these practices (though not all may have taken datura directly; this is not something for the faint of heart). Away from the urban centers of Thailand, a very different view of the world and how it works emerges, a world where energy is more powerful than matter, and in which people can literally cast spells to harm or heal. I know a lot of this will sound completely ridiculous to most westerners, trained as we are in empirical ways of knowing the world and raised in a toxic, synthetic culture of marketing and divisiveness. But wherever tribal or indigenous lifeways remain intact, you will most likely find the kind of shamanic beliefs I have mentioned. Shamanism and animism fit in perfectly well with a Buddhist view of higher reality, in which the physical form is really an illusion and the energy body, the spirit, is the reality. Life in the material dimension, then, is a process of purifying the body and mind so that the spirit can more brightly shine, leading to a better, more aware incarnation in the next life and eventually to enlightenment, in which you are no longer part of the cycle of birth and death. Of course, as in every culture, some people are farther ahead than others. I don’t mean to suggest that all hill tribes are “noble savages,” or that every bargirl in Pattaya knows about these traditions. Many Thais have lost connection with these paradigms, which is a sad but inevitable outcome of development in a global economy, especially in a country with such unreasonable fear of mind-altering substances. But many still retain these connections. And if their belief in spirits seems to you laughable, you would do well to ask them more about it – with a truly open mind. Many will speak with utter conviction about their encounters with the spirit world (if they speak about them at all; many are reticent to tell westerners about these kinds of things because the reactions they get are all too predictable). Not all of them have taken plants to articulate with the spirit world, of course, as it isn’t necessary (or always advisable) to do so. Though you may dismiss their beliefs as childish or naïve or simply mistaken, many of them speak from direct experience. Understand that for them, this world is as real as the one we experience most of the time at “baseline” consciousness. When they wai the spirit house or altar, or leave offerings at a shrine, they are not simply making empty gestures like genuflecting at mass (though of course some are); they are paying their respect to the spirits of their ancestors, which are, to them, omnipresent and fully real. Once you accept that, it is easier to understand a lot of the things you hear from Thais. Some westerners are clued in to this paradigm as well, since many of these ancient traditions are re-entering western culture. And if you are ever invited to participate in a shamanic healing ritual (unlikely, since much of this medicine is closely guarded for obvious reasons), take it. You will emerge from the experience not only understanding Thailand more deeply, but also yourself."